After nearly three months in orbit the Deathguard Cruiser left Eucladus. But not before leaving her a gift. Three days of virus bombs and ordnance laid low to most of the Hives on the planet. When the dust settled the Governor, Barbus, declared himself and his planet separated from the Imperium. Whether corrupted by Chaos or sick of not being protected from the enemies of the Imperium it was not known. Cpl Osten of the 71st Arcite Rifles 3rd Company dug a gloved hand into the tossed and charred soil of Quintarn, plucking a burned-black crop of unknown providence from beside the las-clip pouch of his standard-issue guard webbing. Osten inspected the item, and deciding it was too-far gone to be worth the effort of turning it into a palatable meal, dropped it with a sigh of resignation. Night had fallen on Quintarn, the once-verdant agri-world now crater-strewn and forever burning, the white-phosphorus of the Adeptus Mechanicus burning away any trace of the traitorus Flylord's precense. A welcome boon till the same munitions fell upon the 71st. The day previously they had received a missive from the typically taciturn Mechanicus forces - apparently they had deemed the vehicles of the Rifles to be non-compliant, and demanded they be destroyed less the irregularity led to further tainted machinery. The Commander had attempted parley of course, but his requests for dialogue went unanswered. When the dreaded white clouds of phosphor descended the next day during evening drills, there was little the Rifles could do but sacrifice their rearguard so that the rest might escape the slaughter. Osten absent-mindedly scratched at the red and raw burns on his neck, hastily patched with synth-skin a vastly different hue from his own. So many had died yesterday, the Commander and his retinue included among them. He recalled the blonde-haired officer digging his powersword into the hull of a machine three times the height of a man, even as it silently tore him limb-from-limb. That was the worst thing, Osten decided, about the Mechanicus. They fought in silence - utter, remorseless, silence. After the 71st had retreated, hell, fled for their lives, reports dragged in about the Mechanicus engaging one of the traitor-forces remaining on Quintarn - brass-clad berserkers accompanied by towering engines of destruction and fury. Apparently they had been given the same trouncing the Rifles had, and even now the Brass Horde were retreating towards the embattered unit. They'd be here by the morning, looking to slake their rage on softer prey. "I could run" he thought. "Maybe make for one of the still-standing Combines. If I tossed the uniform I could pass for an agri-worker, perhaps even make it off-world as a refugee. Then Masali is only a few weeks away by warp…"
Before he knew what he was doing, Osten was on his feet, furtively glancing to his left and right. His was a lonely picket, the Rifles had suffered such heavy losses that they barely had enough soldiers for a skeleton watch. He took one step forward, then another, moving on automatic. The crunch of a jack boot from behind brought Osten up short. "I wouldn't, if I were you"
Osten would know that voice anywhere - the General. He could hear the pneumatic hiss of the monstrously over-sized powerfist the senior officer favoured - he could almost imagine the chunky fingers opening and closing in charged-anticipation. Rumour had it that he'd torn it from the body of a Traitor Astartes he had killed in hand-to-hand, many campaigns past. Just one blow from that thing and Osten would be spread across the burned earth like so much fertiliser. "Turn around, lad. 'Tis dark out and my eyesight ain't what it used to be"
Turning, Osten expected to be staring down the barrel of the General's bolter, the same which had sent many a cowardly 71st to their grave. Instead the General simply stood at ease, his non-augmetic hand resting on the small of his back, his flint-grey eyes narrowed and piercing. "I wouldn't run, but, I understand why you would. You saw some hell out there today - enough to shake a man to his core no doubt." The General sighed and looked about himself, surveying the small chem-fires alighting the swags and tents of the 71st Rifles, providing little comfort, but comfort none the less. The silence stretched between them, the soldier and the commander. After some while, Osten finally found his voice. "Are you going to execute me, sir?" The General stared into the middle-distance over Osten's shoulder as he answered. "I could. Maybe I should. In another time and another place I would have - without question. Do you want to die that badly though?" The question caught Osten off-guard and he stammered to answer. "Just listen, lad. Listen to what carries on the night's air"
Clamping his mouth shut, Osten strained his ears, hearing for the first time a quiet yet steady sound carried in on the wind. It was a chant, not unlike the litanies spoke by the guard before battle, though this one's content was not the like of which Osten was familiar. "Blood for the Blood God, Skulls for the Skull Throne. Blood for the Blood God, Skulls for the Skull Throne. Blood for the Blood God, Skulls for the Skull Throne"
Osten visibly blanched as he realised what he was hearing, turning back to the General in panic. "Sir! They, they weren't due till the morning!" The General continued to stare out into the darkness, his face firmly set in a distasteful snarl. "The Traitor-Astartes do not need rest like us common-men, lad. They can run all day and all night without pause. I suspect they'll be on us within the hour." Switching his gaze back to Osten, he continued. "If you want to die, lad, then die. But it won’t be by my hand, it'll be by theirs. At least try and kill one of the Emperor-damned traitors before your lights go out. You're more useful to me that way." Turning on his heel, the General began striding back towards the camp, pausing after a few steps and turning again to face Osten. "'Twas only I who witnessed your folly, lad, and I'm made of sterner stuff than most. But if your cowardice infects even so much as one other soldier, I'll put you down in a heartbeat. Go rouse the others - we've got a battle to fight." The Brazen Lord loomed over the sorcerer, his gauntlet-clad knuckles pressed firmly into all-too-small table which separated them. His brightly polished war-plate stood in stark contrast to the gaudy splash of garish colours displayed by the other, the scent of blood and death and sweat clashing with perfumed oils, incense and musk. "Speak quickly, Sorcerer" the Lord spat the word like a mouthful of ash. "I have little time and less patience for your kind." To his credit the sorcerer sat calmly in his chair, showing no sign of intimidation at the unspoken threat behind the Lord's words. "It's rather simple, Lord Oceiros. I propose an alliance between our forces. It's no secret that the war for Konor treated us both poorly. If we are to avoid the same fate in the Masali Sector, it's only logical that our forces combine." The Lord leaned back from the table, his hand straying to the hilt of his wickedly barbed sword. "Do you suggest my warriors are weak, Sorcerer? That we need the help of your, magicks and tricks" the words spilling from the grill of his helm like the growl of a hungry dog. Holding his hands palm up, the Sorcerer feigned his best apologetic face. "Not at all, Lord Oceiros. It is simply a matter of survival." "Survival means nothing to the Brazen Horde. It matters not whose skull adorns Khorne's throne, only that the pile grows every day." "But of course" cooed the Sorcerer "Wouldn't Khorne be all the more pleased if his most loyal disciples lived long enough to add even more skulls? Spill evermore blood? What is one skull, let's say your own, compared to skulls of the millions you might slay?" The Lord pondered the Sorcerer's words. He knew the sibilant whispers of the other were dangerous and could infect even the most stalwart of minds, for the siren calls of the Prince of Excess were most often mistaken for those of the King of Skulls. "I know of who you face" offered the Sorcerer. "My scriveners have been calling to the warp for assistance, and the Great Ocean has answered. The very same Mechanicus force which routed your warriors on Leobos, and the 71st Arcite Rifles who escaped your axes on Quintarn, are both on Eucladus as we speak." The Sorcerer leaned forwards, his ritually-split cheeks spreading to reveal a reptilian smile. "I can lead you to them. I know where they are." The Lord once more loomed over the Sorcerer, his massive bulk choking the small space between them. 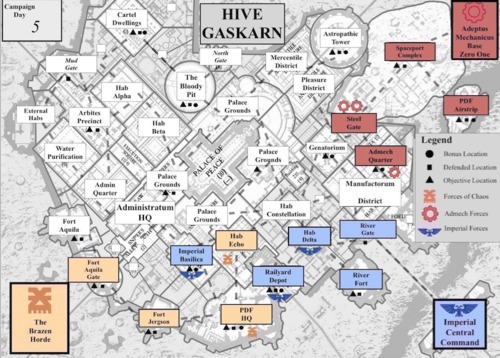 Former LCpl, now Sergeant, Osten spotted Hive Gaskarn through the thick plasteel window of the Halo dropship as it plummeted down through the cloudbanks. 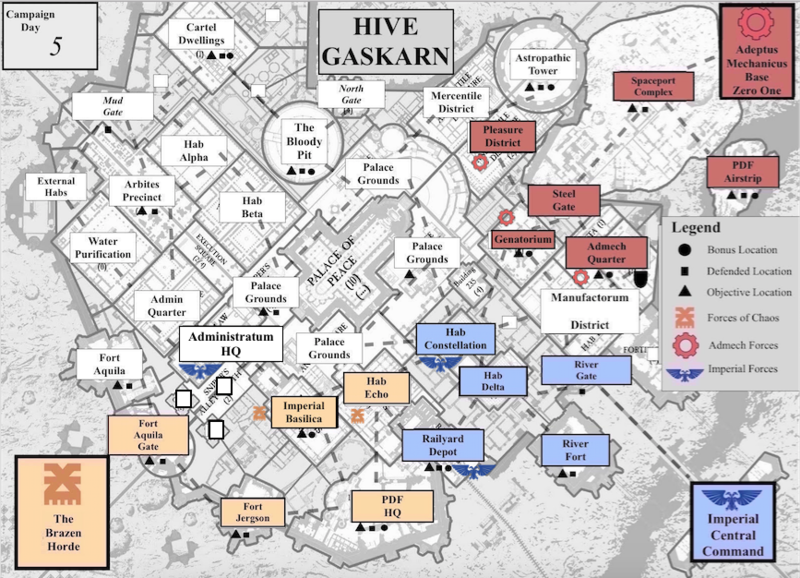 For his valour, and because the previous Sergeant had fallen to the buzzing chainswords of a Traitor Astartes, Osten had been promoted to a new and lofty position, bringing with it a meager increase in pay, and a wealth of new responsibilities. He felt his stomach rise as the dropship lurched, the box-like shape hardly conducive to smooth flying, and squeezed his eyes shut as he wished away the sickness rising inside him. "Sergeant" crackled his vox-bead, snapping Osten out of his self-pity. The voice was unmistakably the General's, and Osten's eyes darted around the red-lit dropship interior searching for the grizzled man's piercing, grey eyes. Some seats away, the General glowered at Osten as the vox-bead crackled again. "Stop feeling sorry for yourself. You wear those stripes now, lad. Now's the time to put on a brave face. Look at the men under your command. They're relying on you to get them through this alive, same as you rely on me, and I rely on the Emperor." Looking about himself, Osten saw the pale and wide-eyed faces of his small squad, every-one afraid as only a man entering battle can be. "Say something, lad" crackled the gravely voice of the General. "Put them at ease. Better to die in good company than scared and cowed." Osten nodded in the direction of the General, and cleared his throat. "By Feth - this bird's bucking worse than that last companion I had. Ship's twice as pretty as she was tho, eh?" This elicited some nervous chuckles from the men beside him, a couple breaking out in grins. Osten continued. "I'm serious - Emperor forgive me, I was desperate for a roll, but even I'm regretting it if she was the last before I go." "She was a sight, Sergeant. Not a sight we'd want to see again in a rush, tho if I remember right, didn't Sethy go right after you did?" By now troopers from other squads were also joining in, ribbing and poking fun. Where once there were only grim-faces and thoughts of death, there was now laughter and good spirits. The General was right, thought Osten as he settled back into his seat, it is better to die in good company. Through a hazy-red vision the Arch-Magos surveyed the encamped horde of Traitor Astartes. He, or maybe it better describes, was not there themself - rather they watched through a high-speed data-link provided by one of the innumerable drones deployed onto Eucladus weeks before. With great interest and growing anger the Arch-Magos spied the fearsome quartet of monstrous infernal engines towering over the lesser-heretics - a trio of figures worked upon the machines, their swirling mechandendrites webbed in baroque runes which caused static interference in the feed when focused upon. Such aberrations cannot be allowed to walk, thought the Arch-Magos. It had assumed them destroyed in the previous engagements on Quintarn, but whatever foul heresies enacted upon the once-noble sarcophagi seemed to stave off all but the most severe of deaths. With a thought the Arch-Magos severed the link-feed, and with another activated the legion of robots behind it. The thrumming of spooling reactors and the crackle of re-routing power-cells elicited an emotion not unlike pride in the Arch-Magos, had it time for such things. The reckoning will be both swift and final this time. 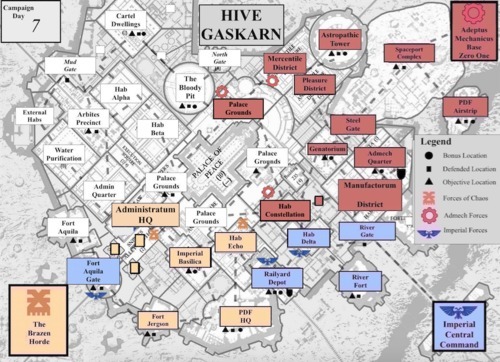 Such were the tenants of the Omnissiah. The forces of the Imperial Guard move into Gaskarn at daybreak, securing the long deserted defences of the River Gate and securing a beachhead with which to venture deeper into the Hive. The servitors of the Adeptus Mechanicus secure the spaceport in less than an hour, moving from building to building to 'reclaim' lost assets. Soon hundreds new battle servitors and servo-skulls follow behind Belisarius' retinue. 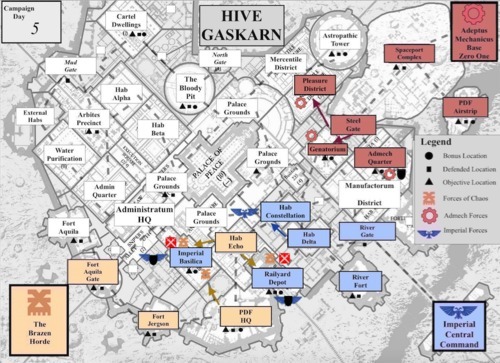 The Brazen Horde have no interest in securing ground, smashing past the remaining members of the Eucladus PDF at the Aquila Gate and pushing at speed into the city. Sergeant Osten stood beside the rest of his squad in the mud, entrenching tool catching the light from the blistering sun. 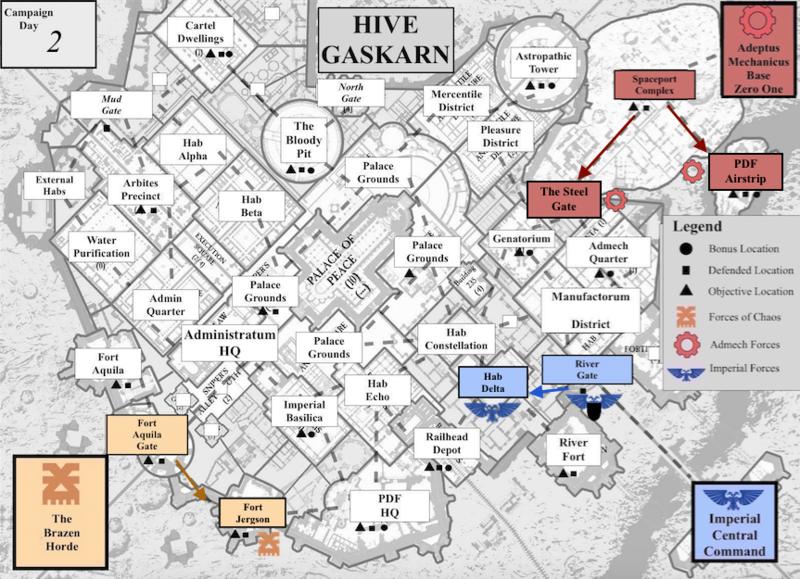 They had made planetfall not two hours ago and the General had driven them into the city before dawn. 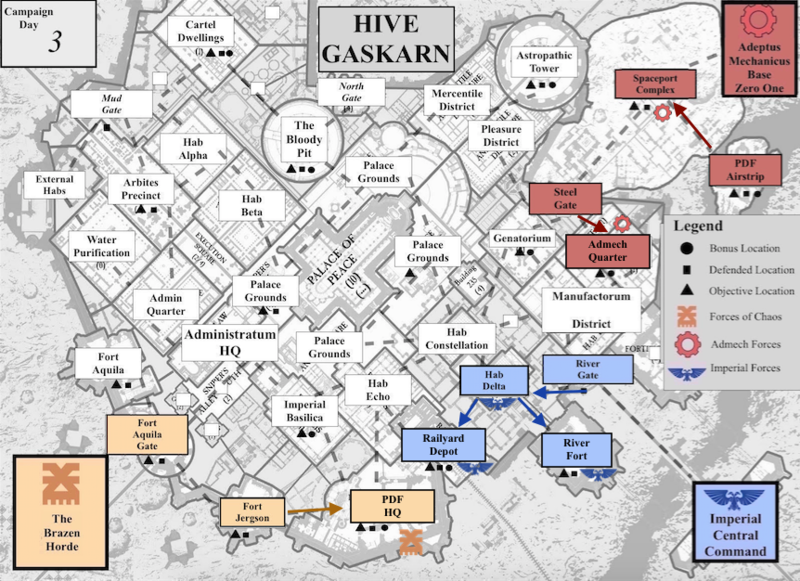 Resistance had been light to none, the odd looters and citizens sent mad by the bombardment that had nearly levelled the Hive. Refugees from the city were sent back to the landing zone to be interrogated and given provisions. They had found the River Gate blasted open and abandoned and Osten's red platoon had been the first through the breach, as always. Lt. Heath insisted on being the first to any new battlefield, his crackling power fist held high, as he had when he had been part of 1st Platoon. Before command. Behind Osten and his squad had rolled the armoured division, the Knight Commander leading the way as always and behind them hundreds more guardsmen bearing the steel and black of the Arcite. Of the ivory giants who had met with the General that morning there was no sign, they had returned to their ship high in orbit to be deployed when and where they decided it was necessary. The Brother-Captain was technically under the General's control but of the few Astartes Osten had seen he doubted any would accept an order from a mere mortal, even one as unsettling as the General. As the forces of the Imperium and Adeptus Mechanicus continue to advance into the city the forces of Chaos take their tanks and walkers along the defensive wall surrounding the Hive. Fort Jerguson is utterly obliterated in a night of destruction as the siege engines of chaos lay low the paltry defences. 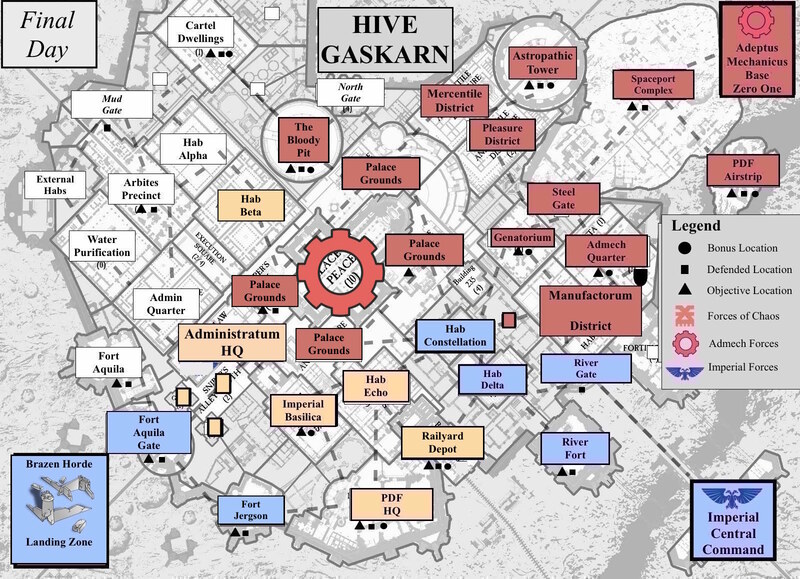 As the Adeptus Mechanicus secure their positions both the Imperium and forces of Chaos break formation and make for the Basilica of Saint Pelius, eager to claim this once holy place for themselves. 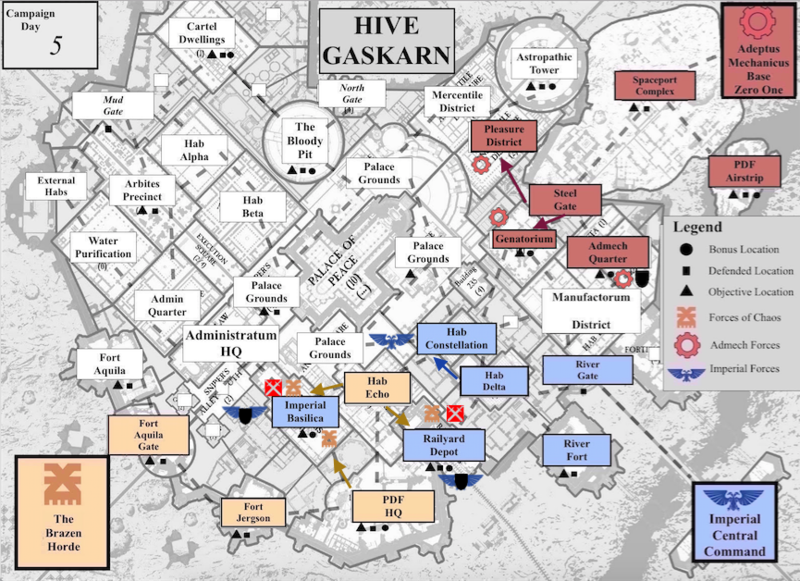 The Brazen Horde met the Arcite 71st Rifles for a battle of the Imperial Basilica. Despite being heavily outnumbered the guns of the Arcite did not tire and the warriors of chaos were thrown back. General Marius was hideously disfigured by a melta blast to the face but despite his bravery the leader of the enemy force was never uncovered. Sgt. Osten nudged the baroque-clad cultist with the muzzle of his lasgun, disturbing the cooling pool of crimson spreading beneath the body. Scary-looking buggers with all their fetishes and masks, he thought, but still men under it all. Worse than cowards - traitors. The sun was rising on Eucladus, the brilliant, blue rays of light cutting through the ruined trusses and beams of the Basilica. Smoke from monstrous daemon-engines caught on the dawn's breeze, adding the stink of malefic oil to the scents of ash, blood and ozone. From amidst the rubble a tarnished, bronze statue of the Emperor-Ascendant jutted from a pile of corpses, Imperial and Traitor, splashed with the blood of both. Osten watched as a figure limped through the charnel house and destruction towards the statue. Even silhouetted against the dawn there was no mistaking the Commander, the grossly over-sized powerfist and heavy twin-pistol casting a long shadow. Once again the Commander had survived the impossible, face to face with a trio of heretical magisters in the final moments of the battle. Reaching the symbol of the Imperium, the Commander stood to his full height and stared at it, watching the statue as Osten watched him. 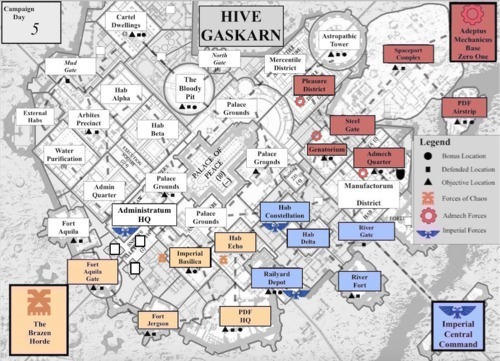 After a full day of battles the forces of the Imperium are set on again by the forces of Chaos at the Basilica. Meanwhile the Brazen Horde also move to break the Imperial hold over the transit systems. 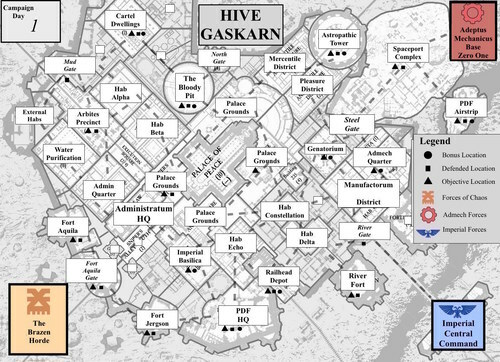 Far to the north the murder-servitors of the Adeptus Mechanicus move into what was once the pleasure district, killing any they find and salvaging them for spare servitor parts. After repelling them once the Brazen Horde reunite with other elements of their army and attack the Arcite Rifles at the Basilica again. Alongside the Traitor Astartes and unholy machines of war now march what remains of the Gaskarn PDF, converted away from the Emperor's light by the heretical Dark Apostles. Vastly outnumbered the Rifles hold long enough for the relics of the basilica to be safely transported away but ultimately the forces of Chaos overwhelm them and seize this once holy place. The troop transport shuddered around Sgt. 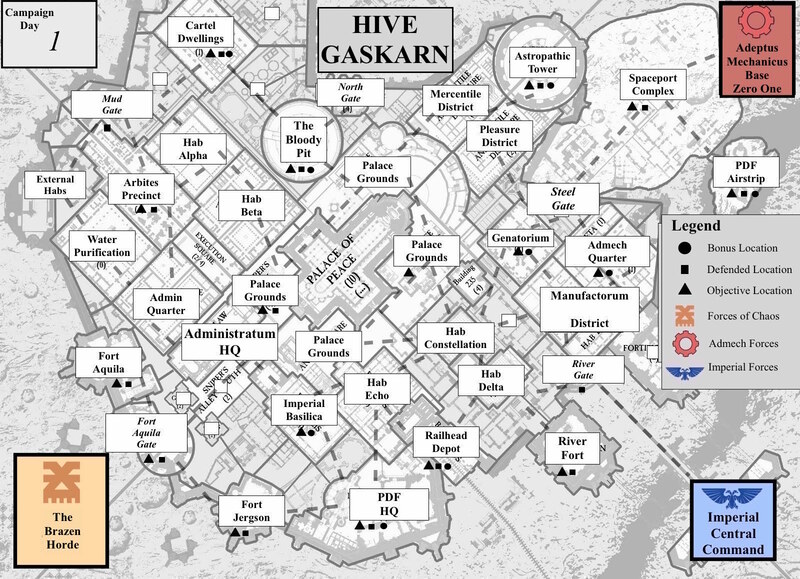 Osten as it drove up the streets of Hive Gaskarn. He still shook from the battle hours after it had finished and held the sheathed blade of Sgt. Leon across his knees. He could still see Leon writhing in the flames. Flames spun from a guard-issue flamer captured and repurposed by the enemy. Men in the ochre and steel of Eucladus who stood side by side with the heretic and the daemon. Osten shuddered at the thought of what could drive these members of the PDF from loyal servants of the Emperor to traitors in so short a time. The General had told him to keep Leon's sword. For his "bravery". But this didn't feel brave. The Rifles were running away and the men knew it. Even the General knew it. Osten saw it in his face as the grizzled commander taught him how to activate Leon's antique sword. A row of troop transports took the few survivors of the Battle for the Basilica into unknown territory in the Hive, hoping to find somewhere to regroup and defend for the night. They had been harried by chaos spawn and traitor Astartes for hours but had eventually broken away in the tumbled down ruins of the Hive. They numbered so few, the days of battle having slowly and surely worn them down and beaten their resolve. But in the midst of the convoy sat a golden ecclesiarchal transport. Loaded to the brim with relics and holy works it was guarded by Father Ferger and his battle priests and attended by the Interrogator, already about his task of cataloging the items for retrieval. Looking at it far ahead in the line Osten had to remind himself this was a victory. But looking at the faces of the few men remaining in his squad, good men who had watched their friends die and nightmares beyond imagining, Osten failed to see victory. 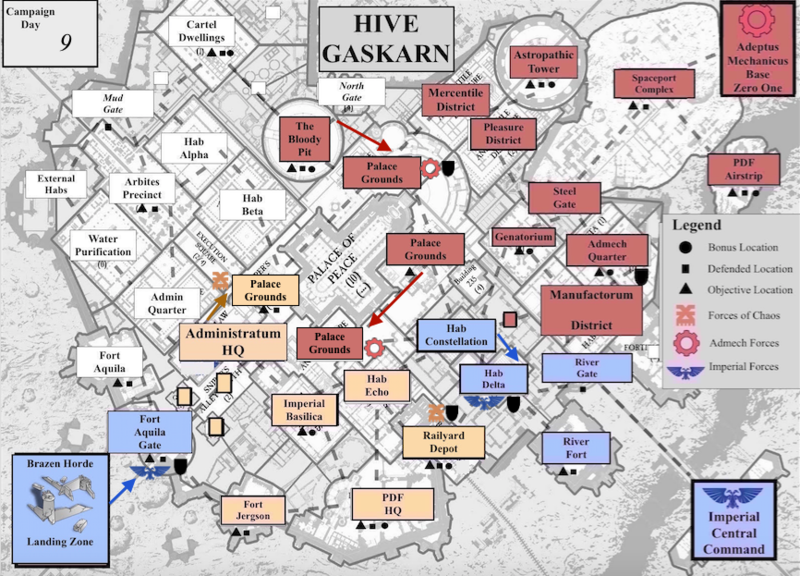 With the Imperial Guard fleeing from the ruined Basilica they hunker down in the remains of the Administratum district, closely pursued by an army of Traitor Astartes and heretics. Meanwhile the Adeptus Mechanicus, considering their truce with the Imperial forces null and void, move to attack Hab Constellation, already besieged by the forces of Chaos. The forces of the Imperial Guard, Adeptus Mechanicus and Chaos meet in Hab Constellation for a battle over the bones of Saint Pelius. A truce between the Guard and Mechanicus is broken as both forces advance towards one another. Seeing this as an act of aggression the Grey Knights of the Ivory Guard drop behind the enemy lines and destroy a number of the priceless Kastellen robots. Soon the Adeptus Mechanicus are pincered between the advancing forces of Chaos and the Grey Knights. They fight bravely but in the confusion of battle the forces of Chaos claim the now destroyed hab. Hounded by the forces of Chaos, General Marius takes his army west out of the city and sets up defences in the Aquila Gate. Meanwhile in the Hive the forces of the Adeptus Mechanicus strike at Hab Constellation once again, defended only by the skeleton force remaining after the last battle there. In Hab Constellation the Brazen Horde are attacked again by the forces of the Adeptus Mechanicus. Although the remaining Horde forces fought to the last they were eventually overwhelmed by the cold supremacy of the Kastellen Robots. Retreating to the north of the Hive, the forces of the Adeptus Mechanicus capture and reclaim the murder servitors and combat drugs at the Bloody Pit, once the entertainment hub of the Hive. Outside the city walls a tactical insertion by Imperial Scions destroys the Brazen Horde landing zone while the Horde attacks the Imperials at the railyard and the Aquila Gate. Sgt. Osten tried not to look as the massive icon was torched by Trooper Hal. Nearby one of the sentinel walkers put its heavy flamer to work burning away a banner seemingly made from stitched human faces. The Father had instructed them to burn anything that made them uncomfortable and in the former Brazen Horde outpost that was almost everything. The 1st Platoon drop-vets had taken the camp with little effort, easily executing what few traitors were left with the drop pods and landing vehicles. Then the Rifles who had accompanied them had swept in. Flamer teams burned heretical icons and piles of flesh they tried not to contemplate while the 1st Platoon veterans set explosives to make the area untenable in case the forces of Chaos returned. 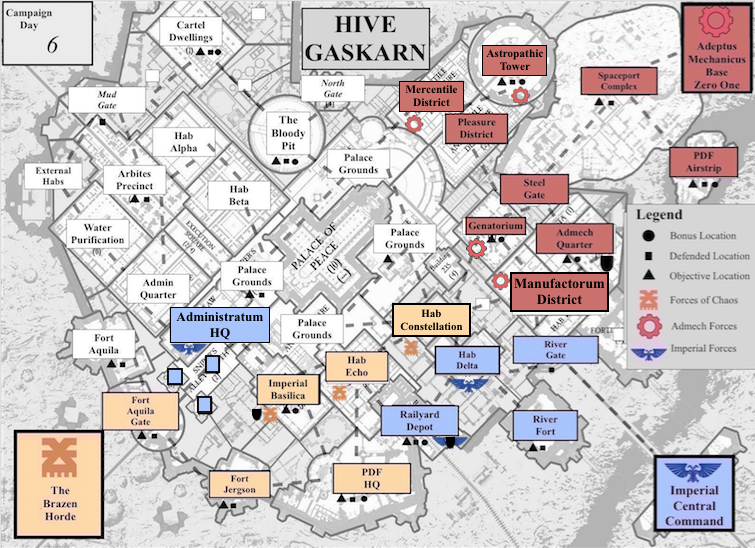 The raid had been an ultimate success but Osten couldn't help but wish he was back in the Hive. Looking away from the mess Osten could see Gaskarn. Flat and grey like some sort of squat crab it sat amongst the scorched earth and forest that lined the river. 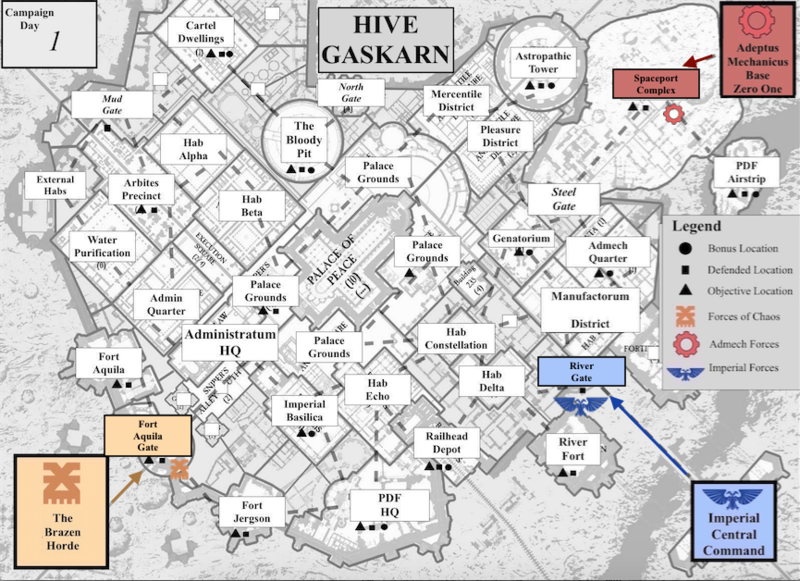 Smoke rose from the Hive almost continuously, whether from small firefights or fires that had been burning for weeks. Far down the road Osten could see the Aquila Gate, golden and glorious even after all this time. He thought of the General and the roughly half of the surviving army still camped there. The heretics would be catching up with them by now and the rest of the 3rd Company would be holding them off. The old defensive plasma annihilator would be booming and the General would no doubt be shouting orders. Holding them off so his platoon could destroy the enemy encampment. Despite the bloodshed surely about to hit Aquila Gate, Osten wished he could be with them. Turning back to his work he tossed a frag into a bone structure and took cover as it splintered across the area. Once again attempting to seize the transit system the Brazen Horde assaulted the Imperial held railyard. The sorcerers of chaos pushed before them hundreds of civilians, minds wiped and controlled by the whispers of Slaanesh. As the once loyal civilians are gunned down by the heavy weapons of the Astra Militarum the forces of Chaos strike. Led by Lord Oceiros himself, the Iron Warriors put into practice a millennia of anti tank warfare. The Knight Commander is run from the field, his fortifications demolished and the vital transit system claimed for Chaos. As a raid took place on the Brazen Horde landing ground the remainder of the 71st Arcite Rifles try to hold the Aquila Gate. The forces of Chaos outnumber then two to one but the Imperials bunker down to defend the ancient gate. As the mortars and heavy weapons of the Imperials open up on the advancing forces of Chaos a strange shimmering portal opens in their lines. A swarm of bronze clad forces rush out, hacking into the lines. After suffering heavy losses a bayonet charge broke the chaos line. The wall was held but at a high price.